It was a first time for me to attend an Improv training today. 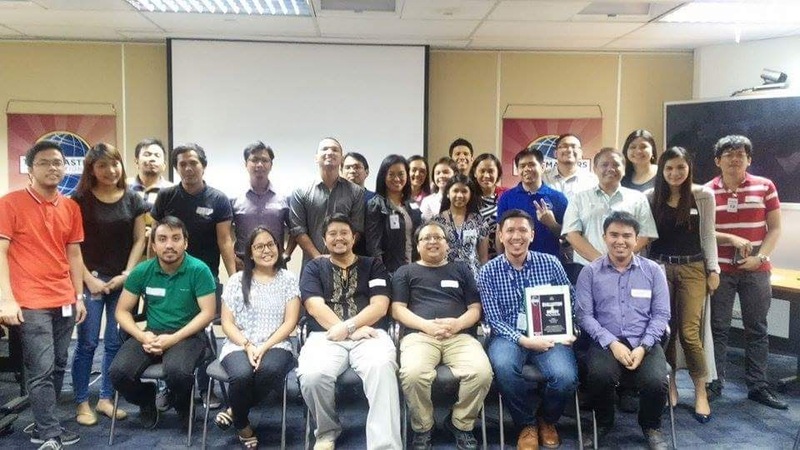 It was at the Evaluation and Improv Training held at the Fluor office in the Asian Star Building, Filinvest Corporate City, Alabang. Attending with me from Alabang Community Toastmasters (ACT) Club was Inah Tolentino (standing, wearing black and center in the front row). 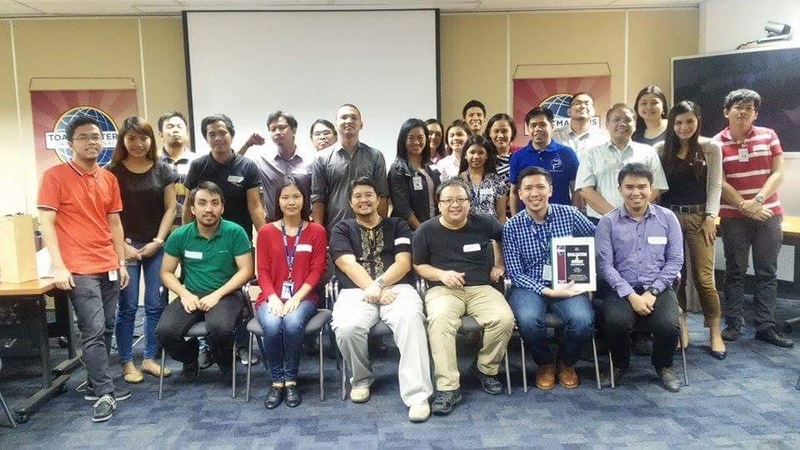 Shown below at the front row, sitting, from 2nd to the left (L-R): Joko Magalong, Jeeves de Veyra, Sasi Casas and Duane Galang. The Evaluation training was conducted by Jeeves de Veyra and the Improv training was by Sasi Casas. They were joined by Joko Magalong. The training was facilitated and organized by Duane Galang from Fluor. The evaluation techniques imparted by Jeeves were both methodical and easy-to-follow. The evaluation tips were excellent! Key takeaways for me were the 3 components of evaluation: Organization, Content and Delivery (OCD). Others were the steps in the process: Observation, Recommendation and Importance (ORI). I came to the Improv training a bit skeptical since I knew little about it other than it was about some role-playing exercises for theater. The Trainers even mentioned that there are plenty of improv in TV comedy shows like "Whose Line Is It Anyway" which I wasn't even aware of. I discovered, however, that these improve exercises can help a speaker become more relaxed, spontaneous and animated with speech delivery. It's unfortunate that only a couple of members in our club were able to attend. 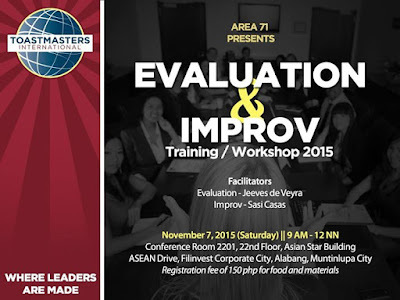 This Improv training session was a big surprise for me and proved to be fun-filled and useful. Maybe we could have a few more in the future. After all, it isn't mainstream Toastmasters training and I'll bet old and new members would benefit from it.